Wilkes University student pharmacist Mia Lussier of Somerset, Mass., isn’t waiting until she receives her degree to start educating others about addiction. Lussier, a second-year student pharmacist, is starting the “Luzerne County Faces of Addiction” campaign which aims to raise awareness of the effects of addiction — all through the power of story. Lussier is working with a joint opioid epidemic and addiction committee formed with members from the Wilkes chapters of the American Pharmacist Association and the Pennsylvania Pharmacist Association, on the campaign. The project will include sharing videos, voice memos and written stories about those who face addiction or those impacted by it, such as friends and family members. Inspired by a similar project in her hometown, called Faces of Addiction New Bedford, Lussier wants to use the idea to share the stories of those in Luzerne County. “I thought it was really cool that it wasn’t just focusing on the people who had the addiction but everyone else. So even if you say, ‘I’m never going to try any of that,’ it doesn’t mean you won’t be affected by it,” Lussier said. Currently, Lussier is inviting Wilkes students as well as the community to submit their stories. She hopes to soon be able to share the submissions with the public. Addiction was not a topic Lussier thought she would be interested in until she completed an internship with Geisinger Health System in the summer 2017. She worked on research focusing on the use of naloxone, a short-acting drug administered in overdose emergency situations to block ingested opioids. Lussier focused on the extent to which it was prescribed and how often it is actually filled. “I was just handed the project and the more I read about it, the more I realized this was a topic I could get into,” she said. Lussier presented her findings at a local and national conference during the fall semester. Balancing a rigorous class schedule and athletics is no easy feat but one made possible through the Wilkes athletics staff. Lussier explained that in weeks with multiple class assignments and exams, softball coach Sarah Leavenworth Maulorico has made it easy for her to be a student and an athlete. Lussier also has taken on roles in numerous pharmacy organizations such as American Pharmacists Association where she serves as the Operation Immunization co-chair and Lambda Kappa Sigma professional pharmacy fraternity where she is the president-elect. Recently, she was accepted into Phi Lambda Sigma, the pharmacy leadership society. 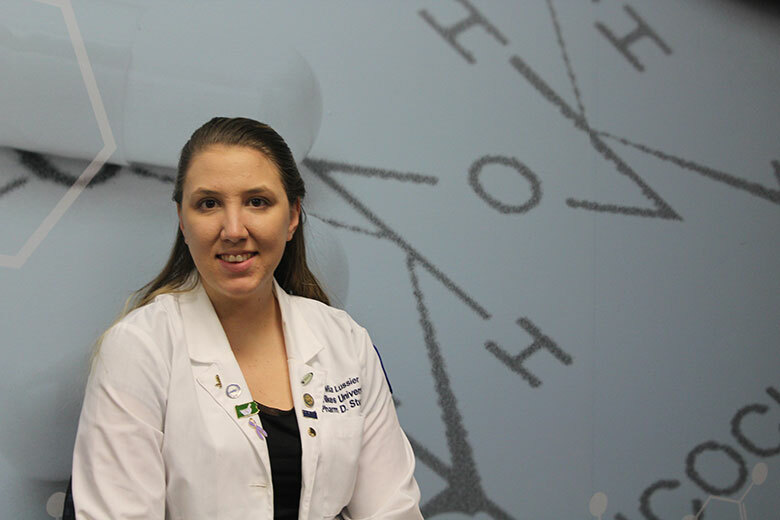 Lussier is also a member of the National Community Pharmacist’s Association, American Society of Health System Pharmacists, The American College of Clinical Pharmacy, The Pennsylvania Pharmacists Association, and sits on the Wilkes pharmacy curriculum committee. Through these organizations, Lussier has participated in many community service projects like volunteering with CEO Food Bank, Backpack Project for the Homeless, and volunteer shifts at free clinics. She has taken special interest in certain outreach. With Lambda Kappa Sigma, Lussier organized an entertainment drive, collecting toys, games, movies and books for the patients at Janet Weis Children’s Hospital. After falling ill herself while in high school, Lussier was hospitalized with minimal activities. Reflecting on this, the collection was her way of giving back. Looking ahead, Lussier has applied for an internship with The Johns Hopkins Hospital which she hopes will give her insight into what path she will take as a pharmacist. Right now, her goal after graduation is to pursue a master’s of public health and to work for a large health system following post-graduate residency or fellowship training.